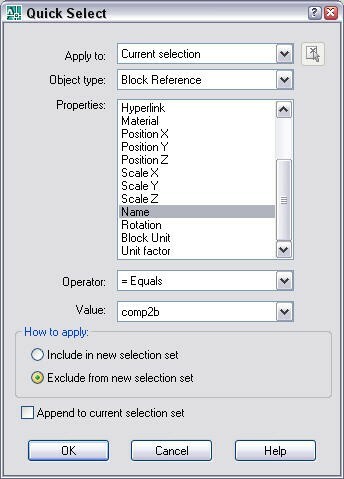 If you would like to see where all the instances of your comp2b block are, you can select them all using the Quick Select feature from the Properties palette. This is a great technique for troubleshooting your blocks. Click the Quick Select button to open the Quick Select dialog box. For the Property, choose Name. For the Operator, choose = Equals (the default). For the Value, choose the block’s name from the drop-down list. All instances of that block are now selected. Is it possible to select all blocks in a drawing and perhaps isolate them? Hi, thanks for this tip, it solved my purpose, I had to select include feature for the problem I was having but rest all I did as you had instructed and it was exactly what I was looking for.